Mother Teresa of Calcutta, winner of the Novel Prize for Peace in 1979, born Agnes Boyaxhul in Yugoslavia in 1910 is herself a bridge between the silent, serving women of the past and the modern woman like Dorothy Day who have made an impact on the world. Tiny Agnes joined the Loretta sisters in Ireland at the age of 18 and within a year was sent to do her novitiate year and to begin her teaching at a high school in Calcutta. She taught there for 20 years, but on the way to a retreat in 1946 says she heard a call to give up everything and serve among the poorest of the poor in the slums of India. From the American Medical Mission sisters she learned some basic medicine, and soon was not just teaching the poor of Calcutta, but treating them in their homes. When an official took her to an abandoned temple to the goddess Kali and offered her the space, she started the hospital and home for the destitute sick and dying known as Kalighat. Over the years she expanded her work enormously by responding to every sort of deprivation she encountered. Houses for her work have been established in many cities around the world. She took in orphans, carried dying old people in, established clinics and care centers for lepers, among other things. Eventually her work led to the founding of her own order, the Missionaries of Charity which now has thousands of members ministering in over 50 cities worldwide. 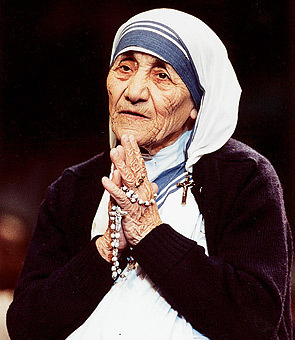 In an era of declining vocations, she explains the attraction of women to her work among the poor as understandable, since “There are women in this work who are still looking for a life of prayer, poverty and sacrifice.” Despite her fame world over, Mother Teresa continued in her humble work among the poorest of the poor in Calcutta, washing her own laundry and doing her own dishes, until she could do so no longer. Visitors were always struck by her simplicity and frugality, and her definite hands-on approach in her care for the dying. Make us worthy, Lord, to serve those people throughout the world who live and die in poverty and hunger. Give them through our hands, this day, their daily bread, and by our understanding love, give them peace and joy. I heard the call to give up all and follow Christ into the slums to serve Him among the oorest of the poor. It was an order. I was to leave the convent and help the poor while living among them.